“It is astonishing that foreign individuals representing respectable institutions would endorse Beijing propaganda, while hundreds of Tibetan political prisoners are still in jail for expressing their views,” said Matteo Mecacci, president of the Washington-based International Campaign for Tibet in a statement Jul 11. She also criticized those who participated in the forum, saying: “only those who wish to be fooled by it will be fooled by it. Intelligent people don’t like being herded, overseen and treated like idiots and they’ll know that the desperate attempt to hide things from them reveals far more about Tibet under Chinese rule than what’s being shown to them.” This was because the participants were not free to air their views, if they were critical, during the forum, or to interact with the local Tibetans without oversight by their Chinese minders. Given the fact that participants in the forum in 2014 had faced questions and criticisms, leading to some of them denying having agreed to the so-called consensus or having had even knowledge about it, China did not publish a full list of international participants in the forum this time, although Xinhua indicated that a representative of the New York-based Asia Society attended, alongside “researchers” from Italy and South Africa, and reporters from Indian, Russian and Thai media. 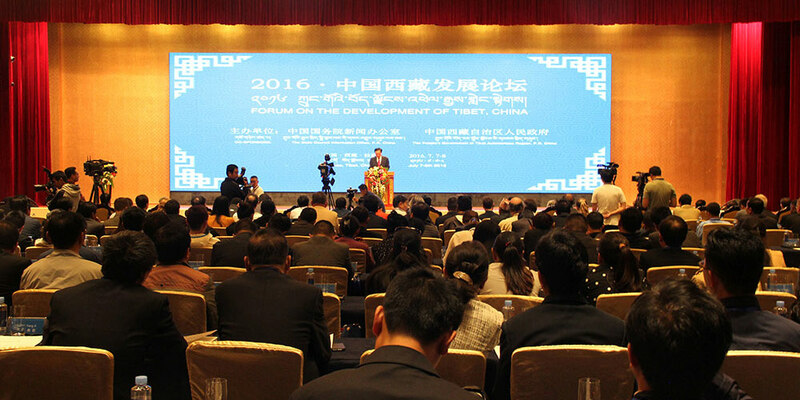 It quoted some of them for their praise of China’s policies in occupied Tibet. The forum was organized by China’s State Council Information Office with the regional government while Mr Liu Qibao, head of the Publicity Department of the Communist Party of China Central Committee, gave the inaugural speech. Asked why major Western media outlets were not invited to the forum, State Council Information Office said on Twitter: “For those questioning: are foreign journalists allowed to visit Tibet? Friends are always welcomed,” reported the AFP Jul 12.